We’ve been at this awhile, now, this barrel-aging thing. You’d almost think we’ve got it down to a science. However, the cool thing about barrel-aging is that it’s not a science. It’s a lot of guesswork. A lot of trial-and-error. We have a general idea of what’s going to happen when we put a new beer inside of a used barrel, but we can’t be sure. Each barrel is different. Each brew is different. Everything’s always going to react differently. Time has an effect. The weather has an effect. Luckily, Head Brewer Brian Hink has learned a thing or two on this crazy journey, and The Topsail may very well be his crowning achievement. This time around, we reused the barrels that housed our first foray into barrel-aging, The Keel. That brew was such a huge success, we were hoping for a little bit of that success to soak into The Topsail. 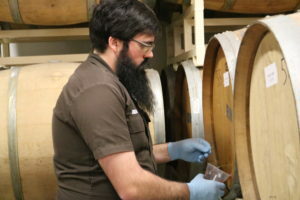 The microbes in those barrels evolved generationally, so subsequent batches in the barrels end up developing more expressive characteristics in less time, simply because of the way the bugs evolve. When it comes to reusing barrels, their first use removes the vast majority of the original flavor of whatever was previously in them, so The Keel used up quite a bit of the initial red wine flavor that was there, but they really weren’t all that different. When we get wine barrels, they’re rarely freshly-used and “dripping with the essence of wine,” as Brian says. That’s the exact opposite of spirit barrels like we used in Boughs of Barley — the bourbon barrels we used in that brew were relatively new, as they typically only use bourbon barrels once before they sell them to us. As you probably know, wine is a lot more stable than beer: it’s relatively inert with little to no CO2 stirring things up in the barrels. Because of that, there’s not a lot of pressure forcing the liquid into the wood of the barrels. For the base of The Topsail, we took a simple Belgian beer with an expressive yeast strain, very dry and very approachable. After the initial fermentation, there was very little sugar left in this brew for the Brettanomyces to ferment. The base brew for The Topsail has a simple grain bill, and Brian wanted to see what the microflora would do with a brew with a simple grain bill and a phenolic and estery yeast profile. “I was really curious to see these bugs playing off of that,” he says. And this microflora blend is more-or-less what was left in the barrels after The Keel came out of them — we didn’t pitch any new microbes in there when we racked the base beer into the barrels. In fact, we’re not entirely sure exactly which microflora were still in the barrels. And a lot of the fun and mystery, too. Our Barrel Aged series has run through a wide range of styles of sour and wild ales. With The Topsail, we’ve essentially come back to our roots, rediscovering what works and bringing it all together for one nearly-perfect brew. At this point, we’ve had a year of the Barrel Aged Series. A year of noodling around on the guitar, finding sweet bass licks, and sizzling new drum fills. Now, the guitar solos are tighter, the drums precise, and the lyrics profound. “In my opinion, The Topsail paints a fuller picture,” Brian says. “That’s not to say I’m not proud of the beers to come before — quite the contrary, I’m extremely proud of the first couple releases and continue to enjoy and love them to this day — but with The Topsail I think we just released our first chart-topping, number-one hit. The Topsail sets sail from The Brewtique at noon on Saturday. It’s nice to get noticed. Everyone enjoys getting noticed. And — hoo-ah! — the mainstream press has certainly taken notice of The Topsail, and we really couldn’t be more gratified. They say that no news is good news, but nah. No news is mundanity. Good news is good news. And we started this year with some pretty good news. There are a multitude of review sites out there and there are a ton of reviews. Some sites are more respected than others, and The Beer Connoisseur is right up at the top. This week, they announced their highest-rated beers and brewers of the year, and some familiar names were among those honored. Cape May in the summertime: awesome. Brian Hink’s beard: tremendously awesome. But don’t take our word for it, take the fact that it’s our highest-rated beer at BeerConnoisseur.com. Take the fact that it’s been flying off the shelves — we’ve already sold 2/3rds of our inventory. Take the fact that it just won a Gold Medal in the US Open Beer Championships! It’s time for the latest iteration of our Barrel Aged Series — The Topsail. 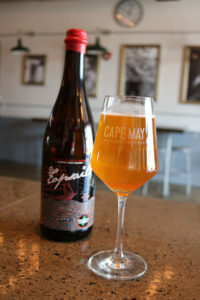 This sour Blonde ale aged for nine months in the same barrels that held our first release in this series, The Keel. An adventurous and intriguing sour Blonde, this 9.9% bad boy expands on flavors found in previous releases in the series. Rustic and earthy, yet fruity and sour, The Topsail’s firm lactic acid presence hints at flavors such as peaches, mangoes, and apricots. Bottle conditioned and ready to evolve, The Topsail is poised to be cellared for up to two years. The Topsail casts off on Saturday, February 18th. Don’t miss the boat! The latest in our Barrel Aged Series is just coming off the bottling line and into the Brewtique! 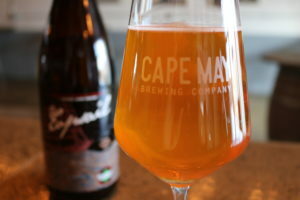 The Topsail — a sour Blonde ale with rustic, earthy notes and a firm lactic acid presence — has been aging for nine months in the same barrels that carried The Keel. And now, it’s fresh off the line and into your cellar. And check out that bottle! Graphic Designer Courtney Rosenberg really out-did herself with this one. The muted reds, blues, and tans come together on this gorgeous 750ml canvas, with the red wax really catching the eye. With plenty of Easter Eggs hidden throughout the design, this bottle is sure to keep you interested much longer than the brew will stay around. And when you’ve got all four bottles from the Bottle Aged Series lined up next to each other, you’ll think you’re sitting back on a summer evening, watching the dolphins breach in the Bay. 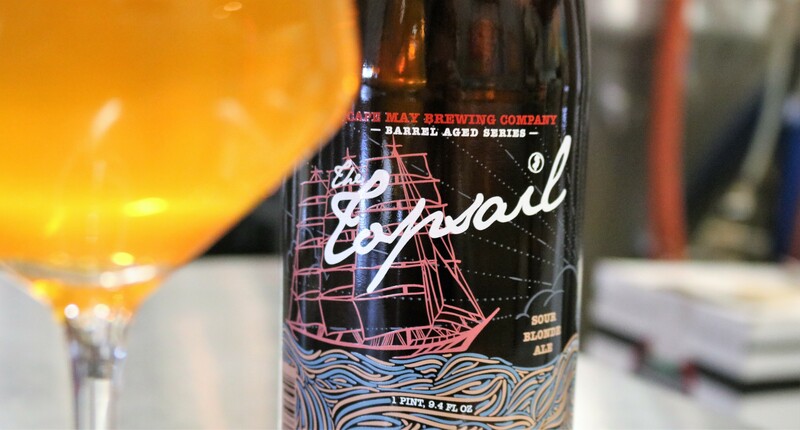 The Topsail sails into the Brewtique and into select bottle shops beginning February 18th. Be sure to grab a bottle. In the meantime, whet your whistle with the video below.